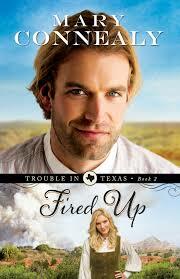 I’ve enjoyed other writings by Mary Connealy and looked forward to book two in her Trouble in Texas series: Fired Up. Dare Riker and his friends formed a bond as Regulators at Anderson Prison during the war between the states. During the first book, they helped Luke reclaim his property and it was during that story that Dare started to fight his attraction for the beautiful Glynna. After all, she was married. By the end of that story, Glenna was a widow and had vowed to never marry or depend on a man again. Dare has no intention of that anyway since people seem determined to try to kill him. Then there is Glynna’s teenage son who is determined to protect his mother at all costs, even if it involves any man who was dare to mistreat her . . . and maybe even kiss her. Dare has his hands full with measels, fires, a knifing and a former patient with a vendetta against him. Through it all, and in spite of Glynna’s tendency to cook things to overdone, they both start to change their minds about each other. I love the stories Mary weaves and the friendships that these men have as they help each other and do not hesitate to speak truth. The faith story is organic to the characters and the I look forward to book three which I suspect will be Vince’s story. After all, what fun is the wilds of Texas if the men can’t find wives and have an adventure getting to the altar? If you like Mary’s writing, you’ll enjoy this story.